Mind bending ambient techno from the On Board Music boss. Here we find a simmering selection of acid-laden ambient techno from Laura BCR, the founder and driving force behind the On Board Music booking agency, label and events series. Having itchy feet since leaving Paris in 2013 to help start the now sadly closed, yet still lovingly revered Bass Cadet Records in Neukölln, the rising French DJ and consummate vinyl enthusiast has moved to all corners of the EU, now finding herself managing operations out of Barcelona while hopping back to Berlin and Paris to throw On Board Music nights on the reg. She’s also recently added On Board Music label head to the resume, securing the services of Italian experimental artist Healing Force Project and Finnish electro don Mesak for the first two of what will be many home-listening excursions to come on OB.M. 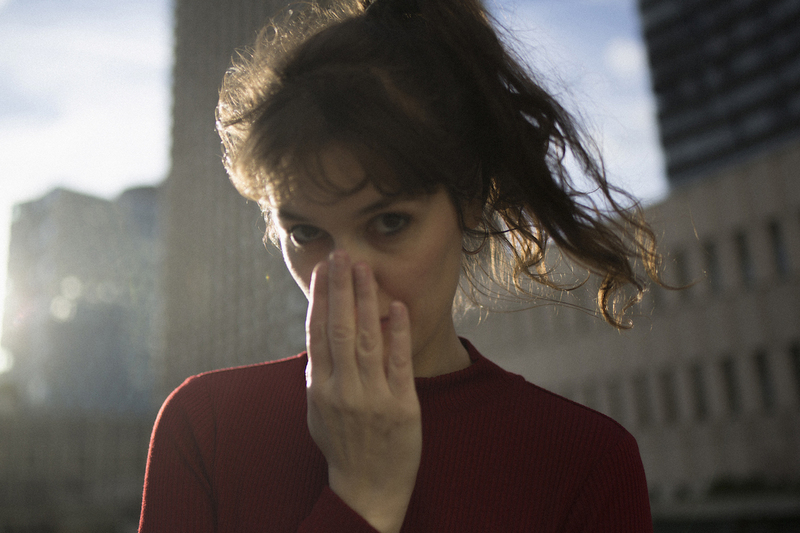 With Mesak’s sublime mini-LP of atmospheric electro and IDM set to drop soon, we caught up with Laura to get the latest on that and help fill in some of the gaps on her unique story to date..
Hey Laura! How are you? I know you had a big party in Berlin recently with artists like Neel and Refracted at ://about blank, how did that one go down? Hey, pretty good just back from two weeks in Germany and in France. Indeed, we did a party with Paral·lel Festival in Berlin in July and that was just beautiful! We had the elements against us, full rain.. but we managed to get a top crowd and people were really into it, staying until the very end. Music from the artists was off the hook. We had Neel, Refracted, Antonio Vazquez, F-On, Grand River and the guys from Patterns of Perception as well. Paral·lel Festival has really something special, vibes, people – it is just magic. Can’t wait to go to their summer camp at the end of August in Spain. On top of your DJing you’re best known for being at the helm of the On Board Music booking agency, label and events series, which all seem to be going from strength to strength.. What have you enjoyed the most about the experience with On Board Music so far, and how might you like to see it evolving in the future? On Board Music was created by accident I would say and I didn’t except at all what is happening now. At the beginning, we were a few friends trying to make things happen and now we are working with some of the best clubs and promoters like ://about blank, Tresor, Concrete, Contact and Rex Club, and more artists have joined us like Cinthie, Point G, Edit Select or Patrice Scott recently to name a few. This is a really eclectic agency. I have many good memories from gigs and travels I did with the artists and what we achieved together – developing and working side by side. Zozo, Caroline Lethô, Jenifa Mayanja, Natascha Kann and more. At some point, due to some hard and not that good experiences i wanted to quit everything at the end of the year but then some good news again and lot of support made me love this job again. Being a booking agent is complicated, you got lot of pressure from everywhere, this is a really stressful job but this is also a strong passion. Many emotions. I’m happy at the moment on how things are turning and I hope everything can continue again in that way. More parties, more music and meeting more nice artists, promoters etc etc. Following your journey to date I know since leaving France you’ve moved around a lot and spent time living in a number of different cities within the EU, with Barcelona your current home base… how has that recent transition been, and do you feel as though building a solid connection with different cities/scenes has helped to grow On Board to where it is today? I moved late from France. I was 28. I’ve spent six years travelling and working as a production manager before in a big music company in Paris. Then I quit everything to join my best friend Etienne (Solune/Arcarsenal) to open Bass Cadet in Berlin. Was a strong experience. I learnt a lot and met many interesting people. When I come back to Berlin I always see someone in the street I know, customers, owners of stores, clubbers. These were four beautiful years. I’ve moved to Lisbon for a few months last year and then now to Barcelona. What is also a good part of that job is you can work from everywhere and most of the time – you make connections by meeting people and travelling. This has been of course a big input. You hang with new peeps, you’re going to new record stores etc etc so you meet more DJs, promoters, bookers. Not sure we’ll stay that long here in Barcelona, we are thinking to move to an other place – when you start to discover more and more cities it’s difficult to stop and to live in a single place. We did a first record with Healing Force Project in September 2017. Then, I had the idea to continue the label with one or two releases a year, kind of mini LP. Last year, I used to play Mesak’s record on Klakson a lot and I was really interested in his work and how he exploits the sound of the machines. His live sets are something really particular. Working with Tatu (Mesak) was super cool because we did something together, and we developed the record from our very first exchanges to become what it is now. He created a really interesting story based on several atmospheres from electro, IDM to ambient. We already have a good support and the record has been played in mixes by artists such as Umwelt or Alienata. We worked with Natacha Mankowski for the cover, she is an impressive painter based in Berlin. I’m super happy with the final result and I hope people will like it. While living in Berlin you became known for being part of Neukölln’s great Bass Cadet Records, a store known for its friendly vibe and being community hub for like minded artists and music lovers. Have you managed to stay connected with those guys since the store closed, and is this the kind of thing you can see yourself being involved in again someday? We created the store in June 2013 then many projects linked to Bass Cadet came out. Etienne – who is also my best friend – was managing the label, his project Arcarsenal and also other stuff around. Matthieu started to run Altered Soul Experiment which is going super well at the moment. He curated a party at OHM in Berlin and is also touring. We did parties in clubs, we played together, we did in-stores with many artists, we also created a big shopping event in Neukölln. Our little store became something strong in the community and the neighbourhood but then we had troubles with money as always when you are running a small business. And on top of that, big construction works destroyed our hopes to sustain. We had no choice than stopping everything, which was also a hard decision. We are still in contact all together because we created some important links and we are friends but we are not really working together anymore – we are advising and helping each other almost every day but we are taking other directions, still growing up. What can you tell us about the mix you’ve put together for us? Any special tracks in there you would like to share? To be honest I wanted to make something totally different at the beginning, and then due to travels and meetings I got new records and another perception on how it should be. Records are new, old, given by friends – it’s a bit a mix of everything, built between Berlin, Paris and Amsterdam. And then recorded with my lovely Tascam and my two MKII turntables in front of a fan in Barcelona. I have a big crush on Luigi Tozzi’s latest release on Outis – especially on the Leto track. Also special shout out to F-On for giving me the latest release on Alpengluhen, his label based in Madrid. It’s a 4 track record by Pajaro Dune. Have a couple of cool gigs in Spain, Germany, Portugal, France etc. So I might continue to play around a bit. We are throwing a party with Inverted Audio in Barcelona on August 31st with the top Doc Sleep from Room 4 Resistance and then doing a release party for Mesak’s record at ://about blank in Berlin on September 27 with friends and artists such as Izabel, Erika which are some of my top artists at the moment. We are working on new collabs for 2019 too. We are doing nights at ://about blank again, Moog in Barcelona and also Rex Club in Paris. Of course continuing the booking agency with the beloved artists I represent, discovering more new upcoming cool artists – and also, I’ll be touring and travelling to South America in October / November 2018 and spending a few weeks with my boyfriend’s family in Patagonia – what has always been a dream. Never been to this part of the world before, so I’m really looking forward to that. Also trying to work on my hyperactivity and having real holidays without opening any emails or computer for more than two days which has been impossible until now. Going to make a test in a few days. Wish me luck.